Splish! Splash! We're going to have a blast! This STEAM time will be all about colors. We used the ALSC blog for station ideas and will be modifying our stations from their presented program. My birthday is on Valentine's Day and I found some really cool historical information surrounding the color history of Valentine's Day. We will have instructions with a mini color timeline and this station will revolve around two options: specific colors to make a valentine card or using a scratch heart board. I found this station with the included worksheet on the PreKinders website. This station explores color mixing from Skittle candies being submerged in water. Kids record their findings on a nifty sheet. I LOVE CREATING DARK SPACES! We surround a little cave area where kids can use flashlights and different color filters to explore light and color. Caretakers/Parents LOVED the color history of Valentine's Day. One of my drop in grandparents told a story about how she works in an international office and realized that only the Americans celebrated this holiday and all of the American employees were sending Valentine's Day cards to their families overseas. I had a bigger crowd than usual which is good news! I've also attached some pictures from this STEAM time. Partial set-up and a few families that drifted in throughout the program. I am passionate about teaching children how to be producers and not just consumers of technology. I am driven about teaching transliteracy and using ICT (Information and Communications Technology) tools to help foster 21st century college and career readiness skills. My organization takes pride in making sure we are always pursuing professional development opportunities. If a training is offered to help us stay relevant: WE MAKE IT HAPPEN! An awesome opportunity was presented in furthering our pursuit of transliteracy and computer instruction when we hosted a Code workshop. What is CODE? CODE is an organization seeking to train the next generation of computer science programmers. I trained at an all-day professional development workshop by CODE. I would highly encourage any educators to take this workshop and gain skills and knowledge centered around computer programming. I could not wait to bring this into my own urban environment and I thought what a PERFECT opportunity to create a STEAM lab. I did some heavy modifying and all these stations described below are adaptable. If you go to a workshop, you will leave with supplies, lesson plans, workbook and CODE "Swag" (freebies), which helps make lesson planning a bit easier. Here is the start (to hopefully) many more STEAM themes around Computer Science. Once our handout is made, I will upload it. The handout talks about the meaning of the word algorithm and gives a sample activity to do. Handout Example: How did you get ready to come to the library this morning? 1, 3, 4, 2---Which order do you do them in? You can create algorithms for ALL KINDS of things that you do everyday! Talk to your child about creating a simple algorithm of what they do in the morning. When finished, take a ziplock bag and put the pieces in order of how you would plant a seed. Once you are done, follow the instructions your child made to plant your very own seed! This next station focuses on the meaning of the word persistence. Our workshop instructor discussed how students in college changed majored due to finding computer science challenging. He encouraged fostering this character trait early! How would we demonstrate persistence? Hard tasks can make us want to give up, but if we stick to our goal and keep trying, then we just might make something better than we’ve ever made before! In this challenge, we’ll work to construct towers that are strong enough to hold a textbook for at least 10 seconds, using everyday materials. 1) Use only the supplies provided in each bag to build a tower. 2) The tower can be any shape, but it has to be at least as tall as the paper cup. 3) The tower must support the weight of a book for a full 10 seconds. The supplies that will be provided in each bag: gumdrops & toothpicks. Again, all the materials for this workshop were courtesy of CODE. This station is all about how computers talk. The handout will tell very simplistically about how computers talk in code in a language of 0's and 1's. 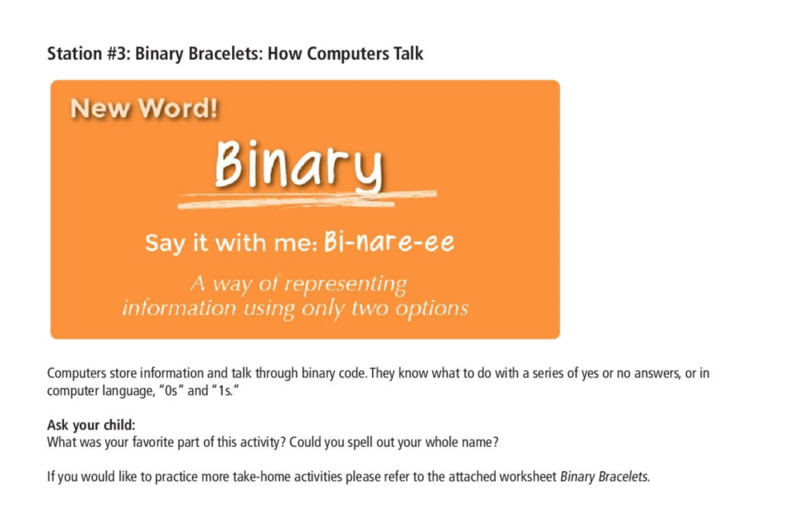 Children will be creating actual bracelets in binary code. Everyone will receive a binary decoder. Create the first letter of your name in binary code! Use the Binary coder to string black and white beads on your bracelet. We will have pre-cut string and a bunch of black and white beads. If parents want to explore doing their child's initial: YAY!!! I'm not going to stop ANYONE! Talk about the algorithm you created in the first station. Talk about the set of instructions in order to help you plant the seed. Let them know that when you give multiple instructions = algorithm and the language is in code than a machine can run what is called a program. This game helps teach your child how to think ahead in multiple steps, as they plan a short route from their friend's start location to the hidden smiley face, up to three steps away. There will be a simple Move it level and a harder Move it level. There are a set of rules located in the lesson plan. We will also be putting the rules on the handout and will be walking through parent/child groups in hopes that they learn it quickly. We are making two simple levels and will see how the "game" plays out. 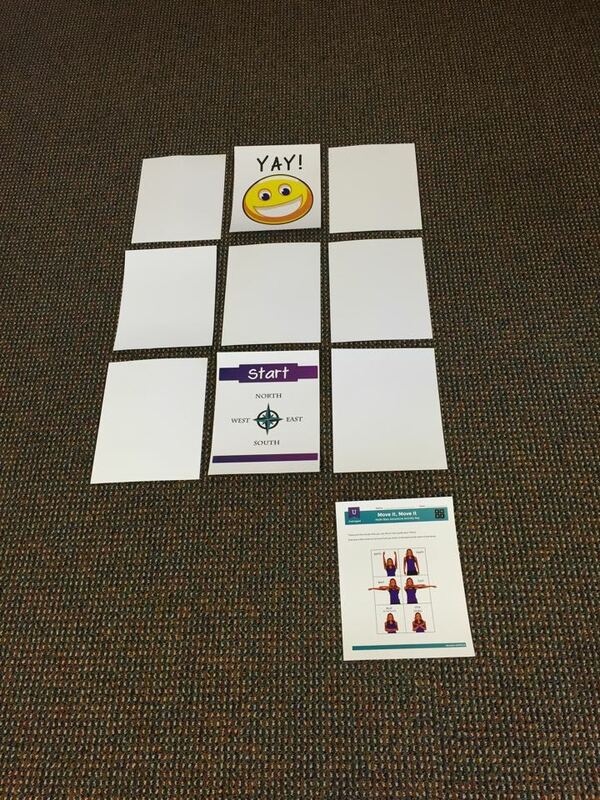 CODE's lesson gives great printable templates when you're doing this game. We're going to print these out the floor stop/start game tiles on legal size paper (along with blank tiles) and on the floor. We will also have sheets of the arm motions to help illustrate unplugged programming. I'm excited to see if kids and parents will learn how to move correctly in the allotted time. Three of the lessons include take-home activity sheets. We will be supplying those for attendees to take home if they want more unplugged computer activities to do with their child. You can find those activities sheets on Code.org's curriculum page. I will definitely repeat this lab again in the spring. I was told by a grandmother with a big family that her daughters had such fun learning. 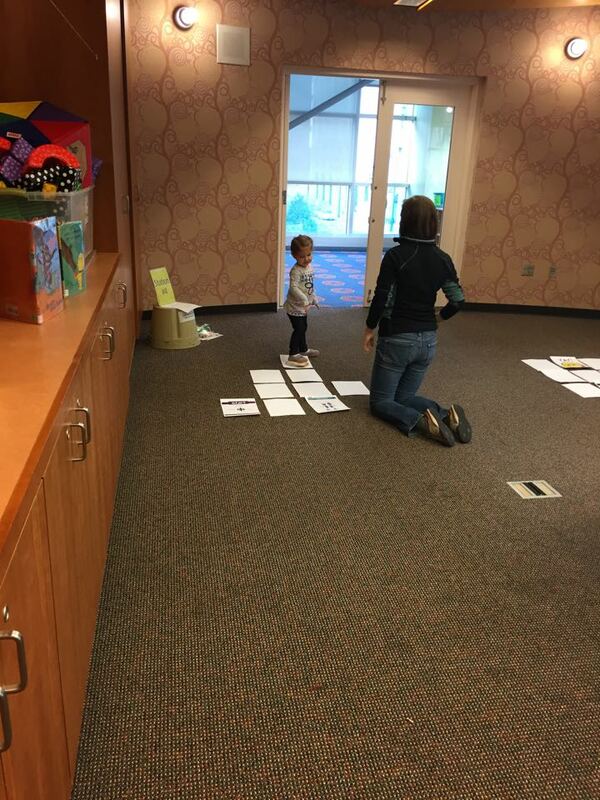 The toddler pictured above was nailing the stations with her mom. The best was watching everyone trying to build a structure that would hold a book up. The cube featured was our best one that held a book up for ten seconds. I am going to revisit the explanation of the first station because some parents understood how it worked and others seemed to struggle with making connections even with the handouts. This week theme will be strength of materials. I'm mostly adapting themes from successful librarian programs and I'm really sad that I will be missing this STEAM lab. My trusty library assistants will be covering this lab for me while I attend a wedding. I love using Miss Amy's STEM lab lesson plans (which we've slightly adapted) and I'm even using her handout. One thing, I've learned about these STEAM labs is the chance for older children to bond with their caretaker. Station #1: Pick a Three Little Pig book to read. After reading the book retell the story using special graphics. Why was the wolf able to blow down a house made of straw? Which house was made of the strongest material? Was the wolf able to blow that house down? What makes a material strong? Station #2: Build a house/structure out of drinking straws. Station #2: Build a house/structure out of dowels. Station #3: Build a house/structure out of duplos. We will be setting up stations with tape for the drinking straws and dowels. After they've finished building, they will be testing their structure’s strength. First they will try to blow it over with their breath, and then try to blow it over with a hair dryer. If it blows over, we've made a chart on a dry erase board to be marked. We will be using this handout . Well, I heard all good things about this event. There was a funny tidbit that we should have used Popsicle sticks instead of cut-up dowels (they were too sturdy and did not blow over). 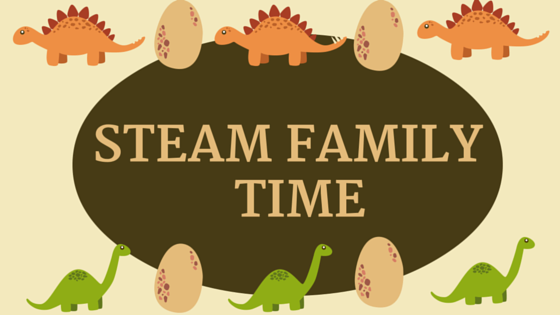 We are debating about having a more structured STEAM class because the literacy activities are not as appealing to caregivers as the activities on the table. I will keep the unstructured theme for this session of STEAM and see what happens in planning for the next STEAM session. STEAM at the library! A experiential lab for families to explore and create!